Our inherent culture gives us the perfect excuse to spice up every bit of gossip and every meal we partake in. The 'moshla dibba', or spice box, has been a staple of all kitchens, specifically those in the south Asian sub-continent. With Qurbani Eid around the corner, we look at the spices that we love the most and not always because it makes our meals a bit healthier, but because some really do like it hot and flavourful. Black Cardamom or 'kali elaichi' is a well known ingredient used in most households. 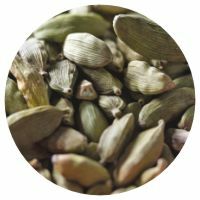 Known for adding the savoury smoky flavour it is associated with, black cardamom is traditionally used in giving garam masala its distinct flavour and fragrance. It is also used in numerous rice dishes and is sometimes chewed as a mouth freshener. Cloves pack a punch. Aromatic and distinctive in flavour, small amounts of this strong spice are used in numerous recipes from meat, chicken, vegetables to sweet dishes as well. It also has a toothpaste flavour to show for itself. The dried flower buds were once the world's most valuable commodity and it's easy to see why. Stack up on this one, otherwise your Eid day meals will go without too many compliments. 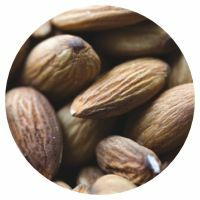 Rich in Vitamin E, almonds are used in both sweet and savoury dishes such as curries. A popular substitute for those with a peanut allergy, almonds' naturally sweeter taste makes it a popular addition to many desserts. This Eid, try your hand at making the famous badam halva, whilst topping your other sweetmeats with this ingredient. The third most expensive spice by weight, cardamom, brings the fragrance and an intense aroma to all foods and drinks where it is used. 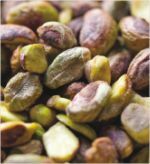 Whether it is the main course, an appetiser or dessert, cardamom can be used to enhance the flavour of numerous items. Another of cardamom's claims to fame is that it has its own Wrigley's chewing gum flavour. It can also be used to cure numerous stomach ailments whilst being a key component of the now-popular 'masala cha'. Nutmegs and maces are two spices derived from the fruit of the nutmeg tree. With the former being sweeter and the latter being more delicate, nutmegs and maces both became a part of the mainstream culinary scene very early on. Another expensive commodity, the nutmeg trees' locations were strictly protected during earlier times and it was also the sole reason for a bloody war waged by the Dutch to control the production and supply of the spice. Pistachio just sounds so elegant. Its fragrance and flavour stand apart from other spices in many ways. It's like vanilla, in the way that it's easily identifiable. Pistachio flavoured ice creams have been around Dhaka back even when Strawberry, Vanilla and Chocolate were firm favourites. It's not mainstream, catering to a niche crowd like a cult favourite or rather the critic's choice. So, this Eid, experiment a bit and stand out in the crowd with your desserts. When I asked mother how 'beef shutki' (jerky/dried beef) is made; she responded with a baffled look. “Your grandmother used to make it,” she responded. And I too could recollect watching Nani go through the elaborate process of cutting the Qurbani meat in small chunks, draining the water, inserting the pieces in a metal wire and finally drying them under the sun for days on end. “I will call Jamini to see if she remembers,” mother gave words of assurance. Jamini khala was my Nani's loyal aide in the kitchen since 'time immemorial'. She came to our household as a little girl and remains with us till this day, when even she, herself, is a grandmother. The telephonic conversation yielded positive results. Jamini khala could recall how this elusive preparation was carried out and I rested assured that this Eid the 'shutkied' variant of gourmet meat will be served on the table. Almost every culture around the world has its own versions of preparing dried meat. The Afghan Lahndi, the South African Biltong or the familiar Pakistani Hunter Beef have all evolved out of necessity for preservation and has imbibed local culinary customs that attributes to the unique tastes each of these preparations yield. The manner of preparing jerky beef around the world is basically the same -- lean meat that has been trimmed of fat is cut into strips, and then dried to prevent spoilage. This drying includes the addition of salt to prevent bacteria from developing on the meat before sufficient moisture has been removed. Cooking beef shutki also has Bangladeshi, regional variants. 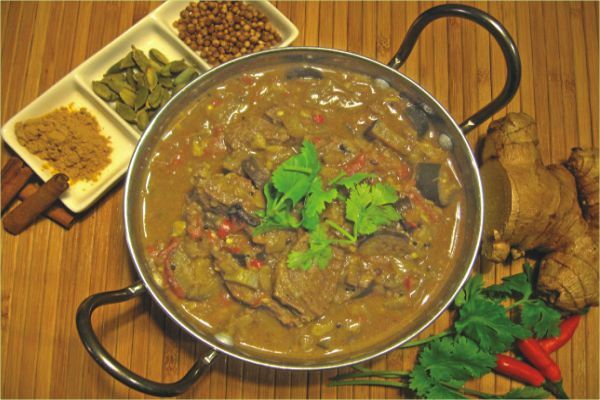 Some prefer to have the dried beef, mutton or lamb (although beef serves best) tenderised on a grinding stone, which would eventually release the meat fibres as it is cooked, somewhat like the 'jhura mangsho'. Before the 'shutkied' meat is ready for cooking, it must be soaked in warm water for a prolonged period. This takes the dryness and revives the hidden flavours. Traditionally, in our household, this particular beef preparation uses fresh mustard oil, rather than the ubiquitous soya, and gives the taste-buds a kick! The quintessential beef dish for all large feasts and banquets in the Chittagong region, for entertaining a large congregation of Mejban (guests) is called 'Mejbani goshto'. The preparation of the Mejbani starts with the selection and purchase of fattened, healthy cattle, Hathajari dry red chillies, radhuni, and 'ghani crushed' mustard oil. These four ingredients are essential to attain the desired characteristic of the Mejbani ghosto. The overwhelming flavour comes from radhuni, Trachyspermum roxburghianum. The cattle is slaughtered and chopped into small uniform pieces (20 pieces per kilogram), every edible part of the cattle is used -- meat, heart, kidney, liver, lungs, bone marrow, brain and pancreas. The head, tongue, tail, trotters, and large shinbones are separately cooked with 'boot er daal' (split chick peas) the customary accompaniment to the Mejbani goshto. Today, the popularity of Mejbani has spread all over the country, particularly in those cities/towns where a sizeable number of Chittagonians reside. Though relished by people of other regions, the specialty of cooking Mejbani goshto remains the forte of the Chittagonian chefs. But do try it for with your Qurbani beef, a good opportunity to come by good quality and quantity of beef. Heat a tawa (griddle) over medium flame; when hot pour in the following: tejpata, cumin seeds, 1 tbsp radhuni, coriander seeds, dry red chillies and turmeric powder. Roast shaking the tawa frequently until the spices release their flavours. Transfer the roasted spices to a metal mortar (Haman dista) and pound them to a rough crush. Set aside. Take a large copper 'patil' (large metal pot), chuck in the following: meat, onions, garlic, ginger, pounded spices, oil and salt. Using a 'kopir' (large metal spatula) turn the meat around until the spices coat all the pieces evenly. Cover the pot with a lid; let it stand for 4 hours. Set pot over a high flame and bring to a sizzle, stirring frequently. As the meat releases its fluid, lower the flame and gently simmer until meat is tender. Heat the tawa; toss in: cardamom, cinnamon stick, cloves, black pepper corns, ½ tbsp radhuni, nutmeg and mace. Roast shaking the tawa frequently until the spices release their flavours. Transfer the roasted spices to the metal mortar and pound them to a powder. Sprinkle this spice powder over the cooking meat and stir to mix. Similar to Mejbani goshto, beef cooked for large banquets in Kaikaprashad-Bhairabpur (Kishoreganj) region, are cooked with the dry ingredients roasted and pounded; other ingredients are roughly chopped and then added. This preparation omits offal but uses mustard seeds to perk up the gravy. Another good recipe for your Qurbani beef. Heat a tawa (griddle) over medium flame, and toss in: tejpata, cumin seeds, mustard, coriander seeds, dry red chillies, turmeric powder, cardamom, cinnamon, cloves and black pepper. Roast shaking the griddle frequently until the spices release their flavours. Transfer the roasted spices to a mortar and pound them to a rough crush. Set aside. In a large 'patil' (large metal pot), chuck in the following: meat, onions, garlic, ginger, pounded spices, oil and salt. Using 'kopir' (large metal spatula) turn the meat around until the spices coat all the meat pieces evenly. Cover the pot with a lid. Place it over a high flame. Lead contents to a sizzle, stirring frequently. As the meat releases its fluid, lower the flame and gently simmer uncovered, until meat is tender. Kala goshto (black meat) a.k.a. 'Kowab er mangsho', is a specialty dry-beef dish of the Chittagong region, where quality beef has been raised for consumption since long. The meat is cooked repeatedly until the spices turn black; the meat pieces are kept intact and the muscle fibres are not allowed to separate, as is done in 'Jhura goshto'. The cut chosen for this recipe is the round, which is a large cut that encompasses the entire rear leg of the animal and includes the shank and tailbone. It is named after the round bone of the femur. This is a hard-working part of the animal therefore quite lean. But thanks to the configuration of the muscles, meat from the round is more tender than meat from the front leg. In a large 'dekchi' (metal pot), combine the following: meat, onion paste, garlic, ginger, turmeric, red chilli powder, coriander powder, cardamom, cinnamon, cloves and ½ cup oil. Mix up with a large 'khunti' (metal spatula) until all the meat pieces are coated with the spices. Pour enough water to cover the meat. Place the pot over a high flame. Bring the contents to a boil. Lower flame to medium and cook until meat is 3/4 done. Take pot off the flame and set aside for 12 hours. Next day, using a pair of tongs, lift out the meat pieces from the pot. Set them aside and reserve the gravy. Heat one cup oil in a korai (wok). Toss in the 'panch phoron'; cook undisturbed for few seconds. Lob in the onion slices. Saute until they are golden brown. Chuck in the meat pieces. Saute for a minute. Pour in 3 tablespoons reserved gravy. Cook stirring over high flame to dry off the liquid. Hold the wok handle with both hands and flip the meat pieces up in the air. This will help to dry off the meat without scorching them. Pour in an additional 3 tablespoons gravy. Repeat the process of stirring and flipping after each gravy-addition to evaporate the liquid. Go on adding the gravy, drying them off and tossing until you exhaust all the gravy. Heat a tawa (griddle), and roast the sesame seeds until they change a shade darker. Pour off and allow to cool. In the same griddle, toss in the following: dry chillies, cumin seed, coriander seeds, radhuni, black pepper corns, nutmeg and mace. Roast until spices release their flavours. Transfer roasted spices to a stone mortar. Pound them into a fine powder. Sprinkle the meat with this powder and serve with the sesame seeds chucked over them. Weddings are joyuous occassions for any family but it must be remembered that it can also be hectic and stressful. Our desi weddings are a week-long if not a month-long festival. Planning must start at least 6-12 months in advance. Finalise a date and set a venue. Then go out and select the invitation card. Choose a beauty parlour, then dream about the clothes, look for the clothes, buy it, tailor it! DO NOT forget starry glitters for the dalas. Go shopping with ma and go on and get a facial. Remember, the biggest headache is looking perfect not only for the wedding, but the reception, the holud and 20 other family occasions. The list of things to do seem endless, which is why it is a boon if you can find all your solutions under one roof at one time. Last year, many couples and their families were put at ease as they visited Gitanjali's Wedding Festival, a destination with a one-stop solution for weddings. It is a platform for those who plan to get married to meet those with all the answers. This year, on November 8, 9 and 10, Gitanjali has decided to organise another fair at The Westin Dhaka. The Westin has come on board as the hospitality partner, providing a spectacular venue for the fair. The sprawling 13,000 sft land is perfect for any occasion, namely a wedding. The jewellery section will be handled by the experts themselves as Gitanjali is an iconic brand and the biggest name in jewellery in India. The original concept designer, Momentum Ltd. (the event management wing of Unitrend) will be managing the show. 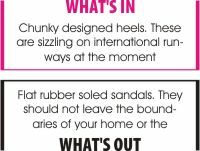 Having a mix of big and successful events under their belt including last year's Wedding festival, they clearly have it all under control. The fashion aspect of the fair will be in the capable hands of Ogaan Signature Collection, the festival's fashion partner and the only official distributor of Ritu Kumar in Bangladesh. Last but not least, broadcasting all the bia-bari activities is the media partner, RTV. The Daily Ittefaq, one of the most circulated newspapers in the country is acting the press partner to cover this glamorous event. There is plenty to discover at the festival so make sure to invite all the members of your bridal party including the groom; you'll appreciate their help in making your decisions. Come with family, friends, acquaintances and enjoy a 3-day long event filled with surprises and gifts.